Sanny gives inspiring lectures on the rich history of linen. Hidden treasures and The scriptures in tablecloths and napkins use slides or a PowerPoint presentation, while The linen set is a workshop for a small group in which you get to admire and touch beautiful, centuries-old linen and damask from Sanny’s private collection. At A damask dinner party Sanny talks you through the different courses, sharing interesting stories about the tablecloths and napkins that you use during the meal. What lay hidden behind the doors of linen cupboards for so many centuries? Why was it kept there, why was there so much of it, and what was it used for? Photographed in the right light, you can see the patterns in the tablecloths and napkins come to life. 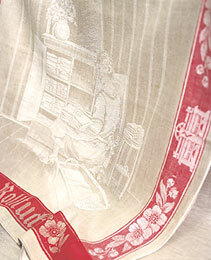 In this way, you learn about the rich history of linen table damask, from the 16th century to the present day. An entire meal woven into a single tablecloth? Fishes on plates, dishes of grapes, and the knives and plates set out ready for the guests. Are they really fallen soldiers you can see, and is it as though you can hear the thunder of the cannons? Learn about the linen set of days gone by – how much there was, and of what – from a time when it was considered a housewife’s most treasured possession. Find out how artists portrayed linen in their paintings, how they painstakingly painted a fold or a pattern, and discover the thousands of almost invisible stitches used to embroider linen. And what about looking after the linen – the eternal sigh of women. Mangles and presses may sound like words from a time long-past, but are surprisingly of our time too. After this lecture, you will always be looking for hidden treasures at the table and in linen cupboards. Anyone who sat at table as a guest in the 17th century could also be served a lesson in the scriptures. God, Creator of the world, spies carrying huge bunches of grapes, Mary receiving a visit from the angel Gabriel – they were all woven into tablecloths and napkins. But why were these woven into damask, and who owned the tablecloths and napkins? Who gave a naked Susanna to three princesses as a diplomatic gift? 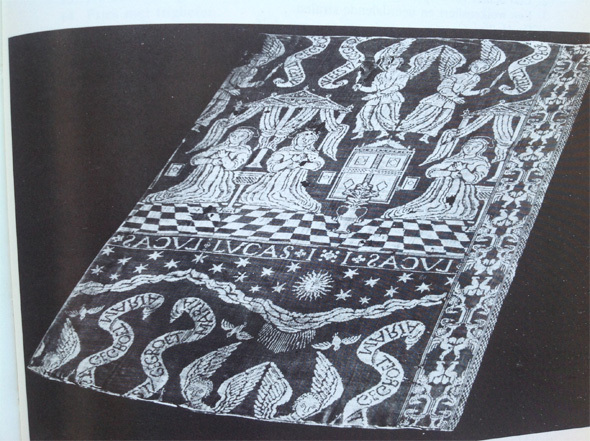 And just how much biblical damask did Quirijn Damast, mayor of Haarlem, own in 1650? Leonardo da Vinci’s world-famous painting The Last Supper was first represented in tablecloths and altar cloths in the 19th century, and these were mainly woven for churches. When a deacon asked Sanny whether it would be possible to breathe new life into the painting she replied ‘Of course’, then wondered how she would do it. It wasn’t easy, but a steel engraving bought on eBay from a New York art gallery provided the inspiration. During this lecture, Sanny reveals the processes that took place before this painting could again be seen in woven cloth in today’s churches. These lectures use either slides or a PowerPoint presentation and can be adapted to groups of any size. ‘Wit gewassen en net in de vouw, dat is een sieraad voor een schone vrouw’ (Washed white and folded neat, a credit to a woman discrete) – this is what Pieter Aersen carved into his future wife’s mangle board in 1665. Using the many beautiful pieces in her own private collection, Sanny explains why linen sets used to be so important and why they have all but vanished in our times. This lecture is perfect for future brides, for a group that includes the bride-to-be, the bride’s friends and mother and future mother-in-law. Seated together at a table, you will be shown beautiful, centuries-old linen, such as napkins with unusual designs and a wonderfully-embroidered, early 17th century bed sheet edged in bobbin lace. 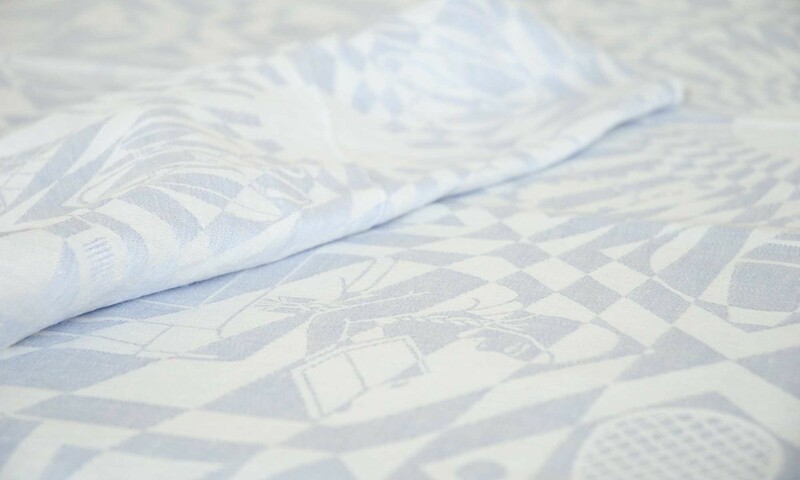 Feel how silky-smooth the sheet is and make acquaintance with dozens of different types of household cloths, each intended for a different job. After this, you will know what it means to say that someone looks ‘tot in de puntjes verzorgd’ (spick and span) and how to put someone ‘through the mangle’. There is also time to look at the beautiful design damask. What a wonderful idea to treat the bride-to-be to this lecture and club together to buy some beautiful linen as a surprise wedding gift. This lecture is for small groups (up to 12 people) and perfect for ladies with wedding plans. Are you looking to add a little something to a dinner party and would you like to introduce your guests to the charms of centuries-old damask and give them something new to talk about? If so, this is the lecture for you. The tables are laid with the more unusual tablecloths of the past centuries and every guest is given a napkin to use, along with information about its age and other interesting facts. While one guest may have a 17th century hunting scene on his lap, the other isn’t sure whether or not he dare wipe his mouth on an original Chris Lebeau design napkin. “What a huge thing, is that a napkin? It looks more like a tablecloth!” – Sanny always gets the same reaction from the guest who is given the silky-smooth 19th century napkin to use. All the tablecloths and napkins are museum pieces that can now be used again for that which they were originally intended – to be enjoyed during a special meal. Starting before the meal is served and continuing between the courses, Sanny keeps the evening going with interesting stories, for example about the towel – who dares dry their hands on the 400-year-old towel? The guests ask plenty of questions and the result is a lively, animated conversation that opens up a new world for everyone. 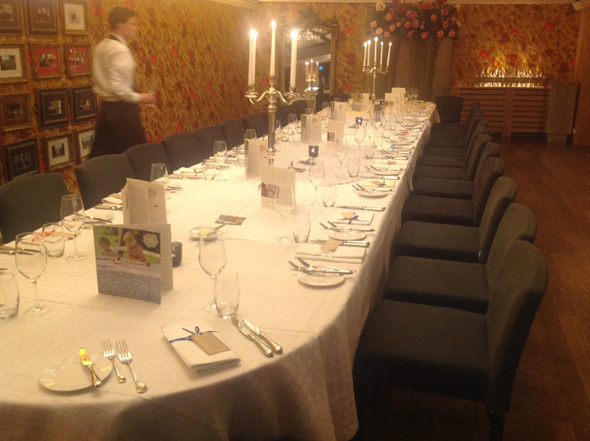 The damask dinner party is suitable for small groups as well as groups of up to 100 guests. The damask dinner party: € 245, plus € 35 per tablecloth and € 5 per napkin. All prices are exclusive travel costs at € 0.30 per km. Please feel free to call for more information and/or to make a reservation, on 003115-213 55 20.